QUESTION: In the July/August 2012 Heartworm Hotline article—Doxycycline in the Management of Heartworm Disease—the role of doxycycline in the medical management of heartworm infection was discussed. What about other drugs? For example, when would you employ corticosteroids, aspirin, and NSAIDs? ANSWER: In my opinion, steroids and nonsteroidal anti-inflammatory drugs (NSAIDs) have a definite, but restricted role in the treatment of heartworm disease (HWD) in dogs. This article will discuss use of corticosteroids; the next article will examine the role of NSAIDs. The anti-inflammatory and immunosuppressive effects inherent to corticosteroids are therapeutic for some aspects of HWD. I make the disease versus infection distinction because I see almost no role for corticosteroids in heartworm infection (HWI) unaccompanied by clinical signs (see Heartworm Infection versus Heartworm Disease). Treatment or prevention of adverse reactions to microfilaricides and adulticides. However, each patient is an individual and corticosteroids are not a benign therapy. Therefore, it is important that practitioners evaluate each unique case, weighing the pros and cons, to decide whether corticosteroids should be part of their treatment protocols. In heavily endemic areas, practitioners assume heavy heartworm burdens and often pretreat infected dogs with corticosteroids, prior to and during adulticidal therapy. The American Heartworm Society’s position on administering ancillary steroid therapy prior to adulticide is: In highly endemic areas, where animals are more likely to have significant worm burdens, glucocorticoids, such as prednisone may be used. This is far from a ringing endoresement for use of corticosteroids in asymptomatic canine patients and has geographic limitations in terms of heartworm prevalence. I do not advocate the use of corticosteroids to treat chronic HWI in dogs with no clinical signs of disease or little to no risk for developing significant pulmonary complications. In my opinion, chronic corticosteroid therapy in HWI to reduce pulmonary vascular lesions is contraindicated. Heartworm infection indicates that the patient is parasitized by at least one life stage of the heartworm. Animals with HWI typically have no radiographic or clinical signs of disease. Heartworm disease affects patients with HWI. These animals manifest radiographic and/or clinical signs of HWD. Allergic pneumonitis (pulmonary infiltrate with eosinophils, eosinophilic pneumonitis), thought to result from microfilariae destruction in the lungs, is very steroid-responsive. It is characterized by cough and variable dyspnea, interstitial to alveolar pulmonary infiltrates on radiographs, and eosinophilic airway cytology. 0.5 mg/kg every other day for the third and fourth weeks. The response is generally favorable, but it may be necessary to treat for a more protracted period of time if recrudescence of cough and/or tachypnea/dyspnea is noted upon tapering. If anti-inflammatory treatment is needed for an extended time, I suggest administration Q 48 H as long as clinical signs can be kept in abeyance. Typically, such extended therapy is not necessary. Eosinophilic granulomatosis, a more serious but rare manifestation of HWD responds less favorably to prednisone. It is characterized by a more organized, nodular eosinophilic inflammatory process, associated with bronchial lymphadenopathy and, occasionally, pleural effusion.2,8,9 With pulmonary granulomatosis, cough, wheezes, and pulmonary crackles are often audible; when HWD is very severe, lung sounds may be muffled and associated with dyspnea and cyanosis. Treatment with prednisone at twice the dosage for allergic pneumonitis is reported to induce partial or complete remission in 1 to 2 weeks. The prognosis remains guarded because recurrence within several weeks is common. Prednisone may be combined with cyclophosphamide (50 mg/m2 PO Q 24 H for 4 days for dogs; ensure adequate diuresis due to risk of sterile cystitis) or azathioprine (1.65–2.2 mg/kg PO Q 24–48 H for dogs) in an effort to heighten the immunosuppressive effect. The latter combination appears to be the most effective. Adulticide therapy should be delayed until remission is attained. Pulmonary thromboembolism (PTE), an acute lung injury, usually follows administration of adulticide, typically by 7 to 21 days as adult worms die and disintegrate. This is particularly true if the dog is allowed to exercise during the first 30 to 45 days after treatment. PTE also occurs unrelated to adulticidal treatment, presumably due to spontaneous worm death. Due to the potential for steroid-induced fluid retention (mineralocorticoid effect), such therapy should be used cautiously in the presence of heart failure or impending heart failure. PTE may precipitate heart failure by structural and functional occlusion of pulmonary arteries (the latter due to resultant vasoconstriction), contributing to elevated pulmonary artery pressures and right ventricular afterload. Despite the fact that no agent is approved by the Food and Drug Administration for the elimination of microfilaria, microfilaricidal therapy has traditionally been instituted 3 to 6 weeks after adulticide administration.8,11,12 However, I agree with the protocol now advocated by the American Heartworm Society: Preventives should be instituted at time of diagnosis, with resultant gradual decline in microfilarial numbers. Note that these recommendations represent an extralabel use of ivermectin. Signs included shock, depression, hypothermia, and vomiting. With fluid (shock dosage) and corticosteroid (high-dose dexamethasone) therapy, all dogs recovered within 12 hours. One fatality, however, was observed 4 days after microfilaricidal therapy. Similar findings and frequency were reported with milbemycin administration at the preventive dose.11 Dogs treated with fluid and corticosteroid therapy should be hospitalized and carefully observed. Third & fourth weeks: Prednisone, 0.5 mg/kg PO every other day. Local inflammation is the most common reaction to an intramuscular injection of melarsomine. This is characterized by pain, swelling, and persistent hard lumps at the injection site, accompanied by muscle stiffness and unwillingness to move. This inflammation can be minimized by careful injection of the drug deep into the belly of the epaxial muscle. Additionally, a short course of anti-inflammatory doses of corticosteroids, given at the time of injection, decreases the likelihood of a local reaction without affecting melarsomine’s efficacy. 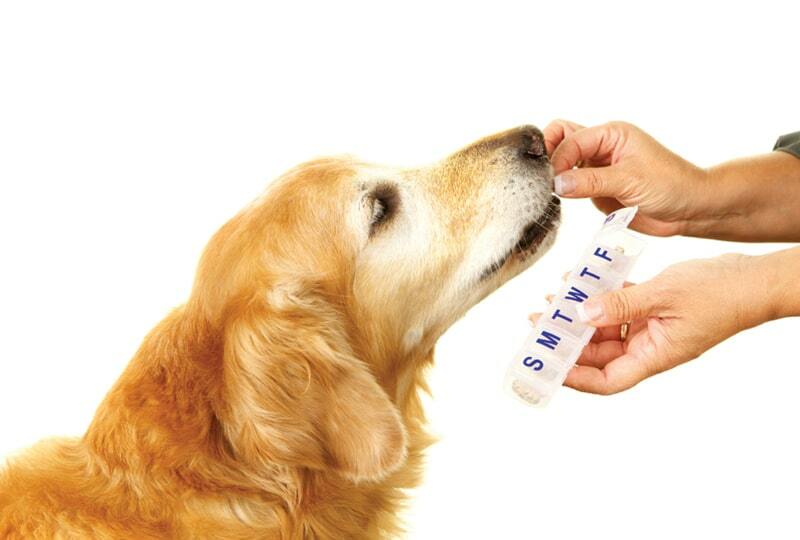 To read more about adulticidal therapy, including 2-dose versus 3-dose methods, read Doxycycline in the Management of Heartworm Disease in the July/August 2012 issue of Today’s Veterinary Practice available at todaysveterinarypractice.com. Side effects of corticosteroid administration include polyuria/polydipsia, hypercoaguability, immunosuppression, diabetes mellitus, iatrogenic Cushing’s syndrome, psychological changes, muscular wasting, and endocrinologic and dermatologic abnormalities. Avoiding side effects is important; therefore, corticosteroids should be used at the lowest dosage possible. After successful resolution of the treated problem, they should be discontinued gradually. If the clinical situation does not allow tapering the dosage to zero, using the lowest dosage possible, every other day, is a relatively safe alternative. Calvert CA, Losonsky JM. Occult heartworm-disease associated allergic pneumonitis. JAVMA 1985; 186:1097. Calvert CA, Rawlings CA. Pulmonary manifestations of heartworm disease. Vet Clin North Am Small Anim Pract 1985; 15:991. Dzimianski MT, McCall JW, Mansour AM, et al. The effect of prednisone on the efficacy of melarsomine dihydrochloride against adult Dirofilaria immitis in experimentally infected beagles (abst). American Heartworm Symposium, 2010. Atwell R, Tarish JH. The effect of oral low-dose prednisolone on the extent of pulmonary pathology associated with dead Dirofilaria immitis in a canine lung model. Proc Am Heartworm Sym 1995; pp 103-111. Rawlings CA, Keith JC, Lewis RE, et al. Aspirin and prednisolone modification of radiographic changes caused by adulticide treatment in dogs with heartworm infection. JAVMA 1983; 182:131-136. Keith JC Jr, Rawlings CA, Schaub RG. Pulmonary thromboembolism during therapy of dirofilariasis with thiacetarsamide: Modification with aspirin or prednisolone. Am J Vet Res 1983; 44:1278-1283. Rawlings CA, Keith JC Jr, Losonsky JM, McCall JM. An aspirin-prednisolone combination to modify postadulticide lung disease in heartworm-infected dogs. Am J Vet Res 1984; 45:2371-2375. Calvert CA, Rawling CA, McCall JW. Canine heartworm. In Fox PR, Sisson D, Moise SN (eds): Textbook of Canine and Feline Cardiology. Philadelphia: WB Saunders, 1999, pp 702-726. Confer AW, Qualls CW Jr, MacWilliams PS, Root CR. Four cases of pulmonary nodular granulomatosis in dogs. Cornell Vet 1983; 73:41. Rawlings CA, Keith JC, Schaub RG, et al. Post adulticide treatment pulmonary disease and its modification with prednisolone and aspirin. American Heartworm Symposium, 1983. Blagburn BL, Hendrix CM, Lindsay DS, et al. Post-adulticide milbemycin oxime microfilaricidal activity in dogs naturally infected with Dirofilaria immitis. Proc Amer Heartworm Sym, 1992, pp 159-164. Neer TM, Hoskins JD. Clinical experience with ivermectin used as a microfilaricide and for prophylaxis in the dog. Proc Amer Heartworm Sym, 1989, p 95.